How our redesign of Love Italy's newsletter successfully portrayed the essential sweet box collection of delicious Italian holidays that are created and offered by ABTOI tour operators, and promoted these holidays via select e-shot campaigns to Love Italy subscribers. ABTOI’s brand Love Italy is a powerful marketing tool that its members derive much benefit from. By belonging to ABTOI, tour operators are able to get exposure for their holidays to Italy through the content programme that Love Italy runs for the British market. As part of Love Italy’s desire to refresh the visuals for the brand and to revitalise the image of the holiday collection, they approached us with the request to redesign their newsletter. The challenge was to create a design concept that would achieve two primary marketing objectives for the brand – firstly, to help their tour operator members promote and sell more holidays to Italy, and secondly, to create enough marketing traction and commercial value to attract more tour operators to Italy to join ABTOI as members. We succeeded to create a strong design concept for the newsletter that communicated the simple message that Love Italy is a sweet box of delicious and inspiring holiday ideas to Italy. Guaranteed to tempt their readers! By showcasing a different smorgasbord of holidays each time and focusing on a different headline message, yet maintaining a consistent visual graphic, we were able to give Love Italy the power to promote and the flexibility to adapt their messaging according to the changing marketing priorities of their members. 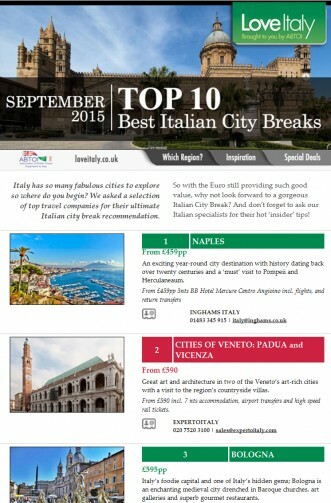 From the best Italian city breaks to Special Offers to region-centric inspiration, Love Italy continued to use our graphic template for their email marketing for many years – and continue to be our client in this field. If you are looking for a strong graphic and content concept for your email marketing campaign, why not give us a call on +44 20 33049811 to see how we can help.